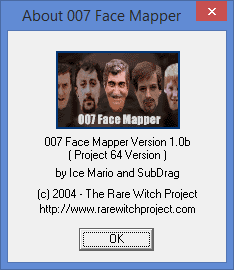 This tool allows you to map your own face onto any guards/players on Goldeneye for Nintendo 64 emulated through Project 64. In order to do this all you need is Project 64, the Goldeneye rom and of course this application. Start Pj64 with Goldeneye as usual, and when you want to replace a face in the game, save the state of the game. (don't forget to choose uncompressed file) Load the created .pj file into the Face Mapper application and this will extract all the face textures in use at the time of the saved state. Double click on an image and insert your own bmp (it must be 32x64 pixels, 256 colors). When you've made all your changes, restore the state of the game using the newly created file, which will be in the same directory as the original .pj file. (named xxxx_new.pj) Use the included codes if you want all of the guards to be the same head, so you can put a face on all the guards. We've included a few sample faces, but be sure to try ones of your own. 1. How do I make the images? 2. Where can I download the Goldeneye rom? Sorry, this is a question that we cannot answer for legal reasons and we would appreciate the absense of any such messages/requests on our forums. This is a beta version. Final product and features may differ.